Object creation using Lambda Expressions, a fast alternative to Activator.CreateInstance. When it comes to creating objects of a generic type the typical solution is to use Activator.CreateInstance. The solution does provide a simple way of creating generic objects, but it comes at a performance cost. It is relatively slow to create an object this way and in performance critical areas of code the impact may well be significant. I’m working on something at the moment that needs to create generic objects and quite possibly a lot of generic objects so I went hunting for a solution that was quicker. // Is there at least 1? // Get our one constructor. // Yes, does this constructor take some parameters? // Pick each arg from the params array and create a typed expression of them. // Create a lambda with the NewExpression as body and our param object as arg. // Create an object creator for TestClass. // Create an instance of TestClass using the object creator. So how does this solution compare to Activator.CreateInstance? 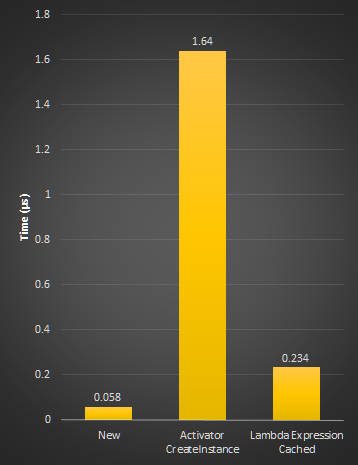 The following graph shows the average time in microseconds (µs) per call. This test was done on a Windows 10 PC with a relatively old Intel i7 CPU. The time to create the same object where the type is known using the normal new() method is included for reference. // Create an object creator for TestClass (Slow). // Create mutiple instances of TestClass using the same object creator. // Each of these calls is fast. This is where it gets fast. 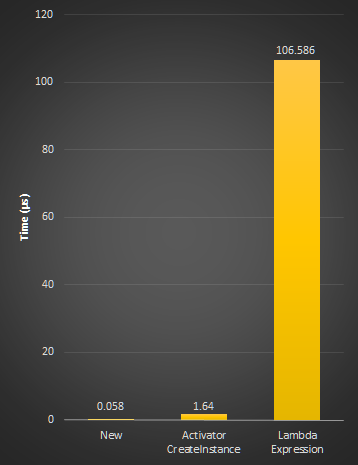 The next graph shows what happens when we cache the object creator and re-use it. Now the Lambda Expression is 7x faster than Activator.CreateInstance and only 4x slower than creating an object of known type using new(). So when you need to create generic objects and performance really matters try this solution. In my next post I’ll refactor this into a static class with helper methods to facilitate ease of use. Thanks to Roger for his post.